Today’s post is from Nicole Allison, MA, CCC-SLP. She currently works in a public school and is the author of the blog Allison’s Speech Peeps (speechpeeps.com). She also serves on OSSPEAC as media chair. In a world where technology constantly changes, it can be difficult to keep up with social media or even see the need for it. I’m slow to change. Okay, actually, I hate change. However, I’ve realized that setting small goals for myself with social media has opened up a world of resources at my fingertips. Here are some benefits I have found using social media for speech language therapy. Resources. Being the only SLP at my district, collaboration with other SLPs in-person is limited. I rely on my social media connections to ask questions about a particular case, gather ideas or simply observe how others would respond if they were in my shoes. Ideas. New therapy ideas are constantly being put out on the web. 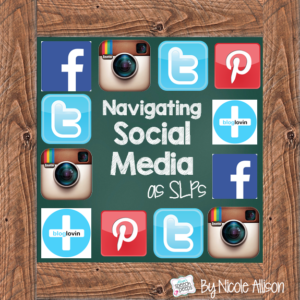 Sites such as Instagram and Pinterest provide quick, colorful pictures of what other SLPs are doing in their rooms. I can usually adapt their idea to fit my students, which is a beautiful thing. Friends. I’ll say it again. I’m the only SLP at my district and things can get a little lonely over in my neck of the woods. Collaborating with others through social media reassures me that I’m not alone at there and that others go through similar situations. The relationships I have built through these networks have been priceless to my career and beneficial to my students. Below is a list of resources that I use in my quest to find resources on social media. Facebook groups are great because therapists (like you) can collaborate among thousands of other therapists. I highly encourage you to try these out. I have asked questions on these threads about scheduling issues, a particular case, and preferences in tests. Remember to keep all names and sensitive material confidential though! Just search for these groups on Facebook and ask to join. Instagram is a new adventure for me but I am LOVING it. It quickly shows you pictures of therapy ideas and insight into what others are doing. It’s also easy to navigate by searching for hashtags (#). Blogs are my favorite because of the vast amount of information you gain by following them. One website that is really beneficial is called Bloglovin. After you sign up, you call search and follow your favorite blogs. Once a week, you’ll receive an email from Bloglovin with any new posts from your favorite blogs. It’s a great way to stay on top of new information without being overwhelmed. Twitter is still an outlet that I’m exploring. Twitter also uses hashtags to make topics easy to search. 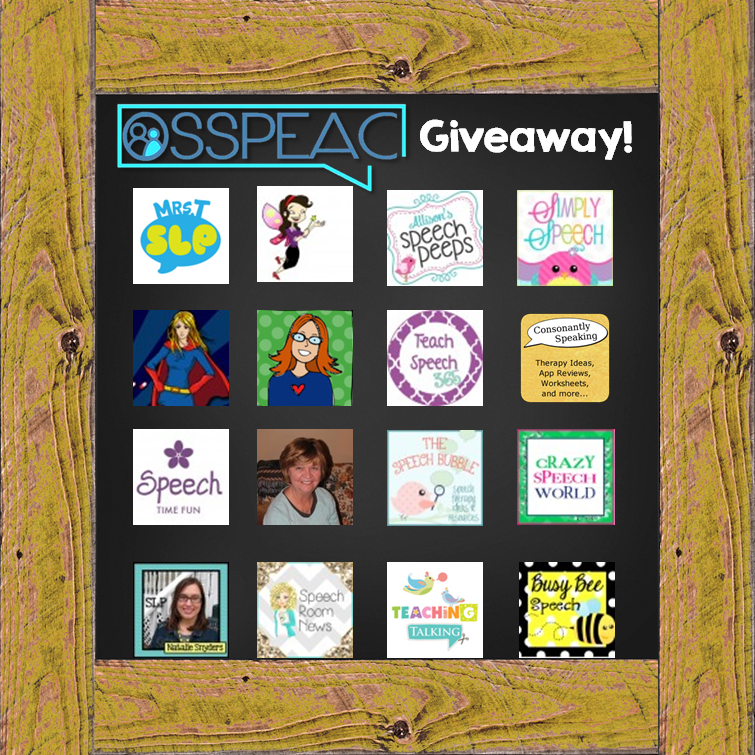 Search #slpeeps and #wespeechies to join conversations. Make a goal to learn 1 new social media outlet per month. Try starting by joining a few Facebook groups this month and learning to navigate them. Once you are comfortable, start experimenting with Pinterest or Instagram. For your next holiday, make a search on Pinterest for speech therapy crafts relating to that holiday. You might just lose yourself on that site! I hope you’re walking away with a few ideas! 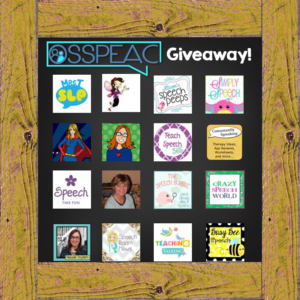 And…because OSSPEAC would love to see you get involved with speech therapy social media, they are having a special giveaway going below for members only (yes, it definitely pays to be a member of OSSPEAC!) They got together with 16 bloggers to give away a bundle of materials worth $100! Make sure to “like” their facebook page to enter! I would love to hear how you’re using social media in the comments below! Thanks for this great article Nicole! I’m happy to be donating to the raffle! Social media and having hundreds of SLPs at my fingertips has made me such a better SLP! Thanks Jenna! I appreciate you donating! Nice article; I appreciate the summary of social media resources and uses! Social media resources have certainly changed my therapy…access to low cost, interesting materials; collaboration/consult with other SLPs; and easy access to information. Thanks to all of you SLPs who spend your time and talents to benefit us all! joining some of the Facebook groups you mentioned, especially for the middle school population. on a daily basis. Keep up the great work!